Help file is blank or "empty"
Upon opening the RivEX help file it is blank/empty as shown below. This may occur if you have downloaded an update or installed RivEX for the first time. Your system is set to not open CHM files from unrecognised sources. You need to remove this temporary block. 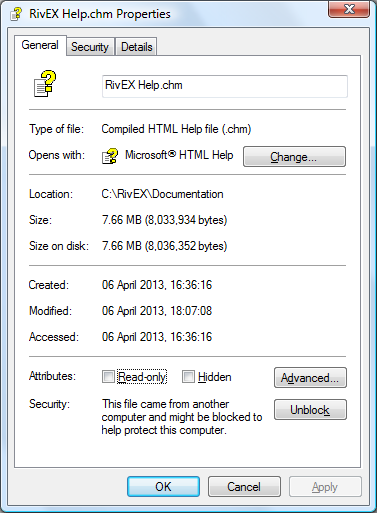 In file explorer, navigate to the Help file in C:\RivEX\Documentation, then right click on the RivEX Help.chm file and select Properties. Under the general tab as shown below simply click on the Unblock button. You will not be asked to do this again once you have unblocked the file.